University Communications and Marketing recently caught up with Allen and asked him about his experiences with the AFL and how the University of Lynchburg helped him get there. You’re currently working for the Baltimore Brigade. How did that come about? [After Lynchburg], I attended New York Chiropractic College, where I earned a Doctor of Chiropractic Degree. After graduating from chiropractic school, I was employed by MedStar Sports Medicine and became the head athletic trainer for the Community College of Baltimore County at Dundalk. I was there for two years and then was offered the opportunity to work with the Baltimore Brigade as the assistant athletic trainer during the 2017 season. At the end of the season, I was offered the head athletic trainer position and I accepted. How were you involved in sports at Lynchburg? I didn’t play any sports while I attended Lynchburg. I was the student athletic trainer for the volleyball team, women’s soccer, men’s lacrosse, and men’s basketball. Was it in your career plan to work with a football team? My dream job is to work with the Baltimore Ravens, so in that aspect, yes, I wanted to work with a football team. I love the sport and being able to be around it every day doesn’t feel like work half the time. What’s a typical day like with the Baltimore Brigade? Every day in the AFL is a different day, but usually I would report to the athletic training room at 5:45 a.m. and prepare for the day. From 6 to 7:15 a.m., I would hold treatment time for the players. From 7:15 to 9 a.m., the team would hold meetings. During that time, I would pack my medical kit for practice; fill up ice chests with ice bags, Flexi-Wrap and ice; fill the coolers and Gatorade bottles with ice and water; and fill the cold tubs for after practice with water. Taping was done between 8:30 and 9 a.m., whenever each position got out of their individual meetings. Practice ran from 9 to 11:30 a.m., roughly, every day. After practice, I would fill the ice tubs with ice and head back to the athletic training room to hold post-practice treatments. Then, from 1 or 2 p.m. to whenever it was finished, I would handle paperwork, scheduling doctors’ appointments, etc. It would average between 10 to 12 hours a day, five to six days a week. 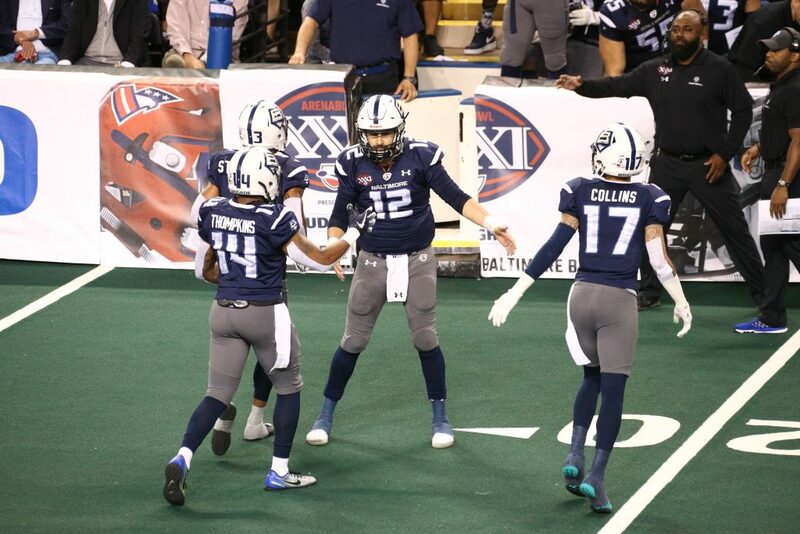 Baltimore Brigade players at ArenaBowl XXXI. What’s the most common problem that you have to deal with as head athletic trainer? I wouldn’t say there’s a common problem to deal with. Being indoor football, we dealt with a lot of sprains and strains and concussions due to the hard surface the guys play on. You went to the ArenaBowl this year. How big of a deal was that for you and the team? It was amazing. The feeling I had when we won the game to go to the ArenaBowl was amazing. I felt like all the hard work and long hours I had put in up to that point were worth it. The week leading up to the ArenaBowl, there was a different type of focus and attention to detail that wasn’t there the weeks before. The guys knew what was ahead of them and just grinded for the entire week leading up to the game. The team felt as though they had prepared the entire season for the game. They felt like they should be there and it was just another game they needed to win to make the season a success. Unfortunately, the game didn’t go our way, but it’s an experience I know I will never forget and an experience I want to go through again. How did your professors and the Athletic Training program at Lynchburg prepare you for what you’re doing now? [My professors] were amazing. They taught me a very strong base of skills that I use every day. The personal attention all my AT professors gave me really helped me prepare for being out on my own. The program gave me an array of different experiences that have prepared me for any situation. Being able to work with so many different sports and different types of athletes gave me the confidence and skills I need to be successful in the business. Between the teaching Dr. Deb Bradney gave me in AT 100 my freshman year to the long, late hours I spent on Shellenberger Field with Dr. Tom Bowman during lacrosse practices, I wouldn’t have changed the experience for anything. As an athletic training student, you don’t have the “normal” undergrad experience. You’re a student and an athlete but not a student-athlete. You have the class schedule like a non-student-athlete and the practice schedule of an athlete. It builds a strong work ethic at a very early stage in your career and prepares you for life after undergrad. Thank you to all my professors — Dr. Deb Bradney, Dr. Tom Bowman, Dr. Pat Aronson, Jim May, Emily Evans — and the entire AT program for teaching me how to be the best athletic trainer I can be.